14 LFC is another of those peculiar vehicles which was never a PSV. 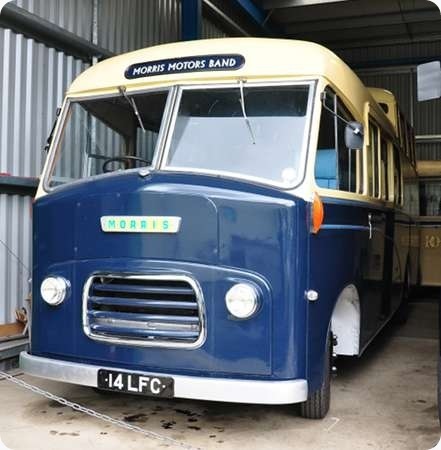 She is a Morris Commercial FF, new in 1961 with a Wadham RC27F body for use as the Morris Works Band transport. I suppose this explains the raised rear part of the saloon – popularly called the ‘half deck’ concept, though I understand that is a different species altogether. She’s seen on 4 July 2012 in one of the sheds at Long Hanborough. I had a short ride on this a few weeks ago at the Hertfordshire showground in Redbourn. The word that springs to mind is "basic". I hope the band didn’t have to travel too far afield from Oxford! Nice unique preserved vehicle though. Thanks for your thoughts. Well, John, one never knows – "many a true word", and all that! …..especially if there were 76 of them! The chassis would have been cheap, since it was made by Morris themselves, but one wonders how much Wadhams charged for a one-off body like this, probably Wadhams only attempt at such a body! Wadham had previously done a 35 seat bus on Morris FF for Liss and District. That was the only FF sold as a PSV in the UK although it did sell in Australasia and in Singapore. Interesting, Stephen. I’ve never seen any mention of Basil Williams’ empire having such an unusual vehicle. Chris, I think we should remember that Liss and District had a life both before and after Basil Williams’ involvement era. Later, it was involved with Creamline of Bordon. I don’t know where the Morris FF/Wadham bus that Stephen mentions fits into this, though. Thx, Michael. Knew of its former life , but not its afterlife! Everything that Basil did was complex; I wonder if he, himself, ever kept fully au fait with his manoeuvrings! One of life’s characters, though, keeping the world from being a duller place, especially for the likes of us! The other vehicle in question was TOU 157. It was new in 1958 and I understand it was purchased by Creamline. There is a photograph of it somewhere on flickr. Thanks to Roger Cox for unscrambling the Liss and District history post Basil Williams. The Empress (Stockbridge) operation had gone to Holland Tours (Patrick & Brown, Oldbury) at first, and then sold to Buddens of West Tytherley. From the PSVC history I looked at it seems that Liss and District became a subsidiary of Empress when this was still owned by Hollands, and remained a subsidiary when Buddens came on the scene. Buddens then sold Liss and District to Creamline of Bordon as a subsidiary of that group. The sale to Hollands was in Dec 1954, the sale to Buddens in Apr 1955, and to Creamline Oct 1955. And we thought the deregulation era had quick sales! 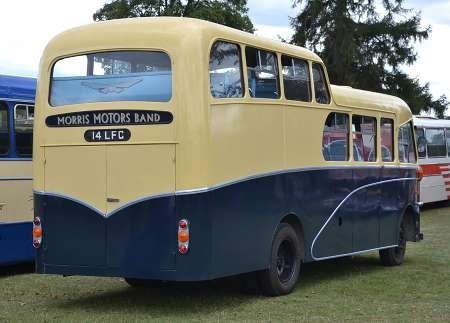 The Morris Commercial TOU 157 is pictured as indicated by Chris Barker, and this shows it to be an "ordinary" saloon, i.e. not with a half deck at the rear for the 76 trombonists(!). The history of Liss & District, post-Basil, is as complex as Basil’s Empire (well, almost!). Being at Bordon, I imagine that Creamline benefited from the army weekend work in the way that Silver Star did, until the end of National Service and contraction/civilianisation at least. Chris Hebbron about Creamlines participation in weekend Forces leave services. They ran from camps in the Bordon/Aldershot area to London, Warwick, Birmingham, Manchester, Leeds and Sheffield (at least) and bought mainly AEC Reliances with Duple bodies seating 43 for this work. They usually kept them for 2 years and replaced them with new coaches. flickr has a group devoted to forces leave services with several Creamline photos. Thx, Paul. This work, nationally, must have been a lucrative source of income, since poverty-stricken National Serviceman, anxious to get home to girlfriends/families would use them to the full, until it dried up around 1962. Strangely enough, even though I was based at RAF Stafford, a large Maintenance Unit, in the late 1950’s, and one or two other camps, I never saw/noticed any coaches on these services. I always went home by train, passing through Liss Station on my way home to Portsmouth. I’ll look up Flickr. This vehicle was at the Alton Bus Rally Sunday 19th, and I attach two more views of this interesting vehicle. Thx, Pete, for the new photos, giving a much more rounded idea of the bodywork. This complex body design, must have been quite an interesting challenge for Morris employees, building just the one-off. It’s certainly not unattractive. Thanks, Chris. I can’t help but feel the folk in the back (raised) portion wouldn’t have had much forward vision. Was that to help them concentrate on their music? The large boot was for the percussion instruments and the larger brass instruments. Lord Nuffield loved his band. Looking at the two above photos, I can’t help thinking that the narrow front wheel track was not a great help in cornering? 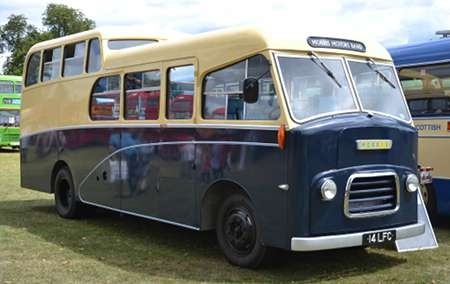 I recall driving a Karrier/Commer Spacevan once or twice, which, with a narrow front axle compared with the rear one, had appalling cornering ability, digging in at the front, even at modest speed, which, on reflection, was the only speed it ever achieved! Even for the 1980’s, it was a dreadful vehicle! I dont think the track on the Morris FF was any narrower that on similar vehicles of the day such as the Bedford SB. The Commer FC ‘Spacevan’ was a much smaller vehicle.